Feeding: St. Bernards are prone to bloat; as such they should be fed two or three small meals a day rather than one large meal. Temperament: The Saint Bernard is an extremely friendly and gentle dog who is very tolerant of children. They are patient, obedient and extremely loyal dogs who love to please. Shedding: The Saint Bernard sheds twice a year. Grooming: Both coat types of the Saint Bernard are easy to groom. They should be brushed with a firm bristle brush and bathed only when necessary as over bathing can strip the coat of its natural protective oils. Training: The Saint Bernard should be trained and well socialized at very young because of their size. They are very intelligent and relatively easy to train. It is important to also teach them not to jump as a puppy as when they reach their full grown size they could seriously hurt someone. Weather: St. Bernards have a low tolerance for hot weather and should never be left outside or in a car during warm weather. Exercise: The Saint Bernard requires a long daily walk to keep them in good physical and mental condition. Living Conditions: The Saint Bernard can live in an apartment provided they are given enough daily exercise. They are not very active inside and a small yard should be sufficient. They can be outdoor dogs but are happier living indoors with the family. Appearance: The Saint Bernard is a large and powerful dog with a strong and muscular build, powerful head and intelligent expression. Size: The male Saint Bernard should a minimum of 27½ inches at the shoulders, females should be 25½ inches. Their overall weight is between 110 to 200 pounds. Head: The head of the St. Bernard is broad and massive giving it a very powerful and imposing look. It is slightly arched with the sides gently sloping into the strongly developed, high cheek bones. The occiput is only moderately developed with the supra-orbital ridge being strongly developed forming close to a right angle with the long axis of the head. The St. Bernard has a deeply imbedded furrow that runs between the eyes. The lines on the sides of the head diverge from the outer corner of the eye toward the back of the skull. The forehead is covered in noticeable wrinkles which converge toward the furrow. The face slopes rather steeply into the muzzle. Nose: The St. Bernard has a very large, broad, black nose with wide open nostrils. Eyes: The eyes of the St. Bernard are set moderately deep and closer to the front of the head than the sides. They are medium-sized and dark brown in color giving them a friendly, intelligent expression. The lower eyelids do not go completely closed and thus form a wrinkle at the inner corner of the eye. Ears: The ears of the Saint Bernard are medium-sized and set high on the head with a strongly developed burr at the base. At the base they stand slightly away from the head with a sharp bend as they drop toward the side then cling to the head without turn. The ear flap is soft forming a slightly elongated rounded triangle. The front edge lies firmly to the head. The back edge may stand out from the head, especially when the dog is standing at attention Lightly set ears, which at the base immediately cling to the head, give it an oval and too little marked exterior, whereas a strongly developed base gives the skull a squarer, broader and much more expressive appearance. Muzzle: The muzzle of the St. Bernard is rather short and does not taper. The height of the muzzle at the base must be greater than its overall length. The bridge of the muzzle is straight and never arched but is occasionally, slightly broken. A broad, well-marked, furrow extends from the base of the muzzle along its entire length to the nose. The upper jaw has strongly developed flews that turn in a curve toward the lower edge with a slight overhang. The flews of the lower jaw should not be deeply pendant. Teeth/Bite: The Saint Bernard has strong, sound teeth that meet in a scissors or an even bite. Neck: The neck of the Saint Bernard is very strong and set high on the shoulders. It is carried horizontally or slightly downward except when the dog is at attention, and then it is carried erect. There is a distinctly marked indentation where the neck meets the head. The nape is very muscular and rounded on the sides with a well pronounced dewlap giving it a rather short appearance. Body: The Saint Bernard's chest is well arched and moderately deep, extending to but not below the elbows. The back is very wide and perfectly straight to the haunches, and then gently slopes to the rump blending nicely into the base of the tail. The belly is distinctly set off from the powerful loins with slight draw up. Forequarters: The powerful and pronounced shoulders of the St. Bernard are wide and sloping. The upper arms are very powerful and muscular. The lower legs are straight and strong. Hindquarters: The hindquarters of the Saint Bernard are well-developed with very muscular legs. The hocks have moderate angulation. Feet: The Saint Bernard has broad feet with strong, moderately close toes with rather high knuckles. The rear dewclaws may be left if they do not hinder the Saint Bernard's gait in anyway but are not desired. Tail: The bushy tail of the Saint Bernard is long, broad and powerful. When the dog is at rest the tail hangs straight down with a gently upward curve in the lower third. When the dog is in motion the tail is turned upward but should never be curved over the back. 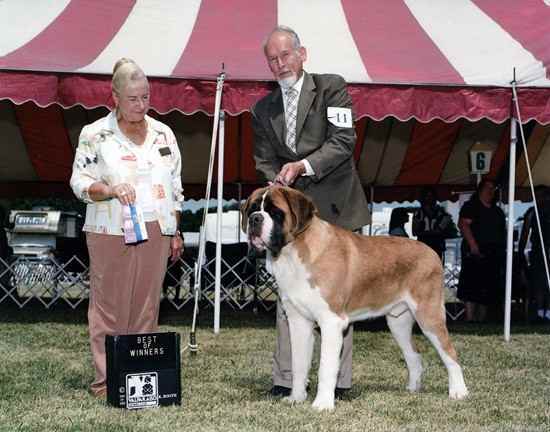 Color: The coat of the St. Bernard is White with Red or Red with White. The Red can be in various shades with brindle patches and white markings. The Saint Bernard has white markings on its chest, feet, collar or nape of the neck, tip of tail and noseband. Coat: The Saint Bernard comes in a Shorthaired and Longhaired variety. The Shorthaired has a short, tough, very dense coat that lays smooth and should never be rough to the touch. The coat on the thighs is slightly bushy. The coat at the base of the tail is longer and denser, gradually becoming shorter toward the tip. The Longhaired has a medium length coat that is straight to slightly wavy. The coat on the haunches and rump is typically wavier than the rest of the coat. The tail of the Longhaired is slightly bushier with a longer coat. The face and ears are covered with a shorter coat. The front legs are slightly feathered with bushy thighs. Life Expectancy: The average life expectancy of the Saint Breed is about 8 to 10 years. Characteristics: The Saint Bernard has a superb sense of smell and a keen awareness of impending storms and avalanches. They make excellent watchdogs as their size is a good deterrent. They tend to drool a lot after eating or drinking. Health: The Saint Bernard typically has good health but can be prone to 'wobbler' syndrome, heart and skin problems, hip dysplasia, extropion, twisted stomachs and bloat. Eye Health: The eyes of the Saint Bernard, which have a tendency to water, need to be kept clean and free of irritants. History: The Saint Bernard is a very ancient breed being founded by St Bernard de Menthon in AD 980. They were used to help travelers through the Alpine pass between Switzerland and Italy. They are descents of the Tibetan mastiff, originated from the mastiff brought to the Alps by the Romans around 1000. They were then crossed with the Great Dane and the Great Pyrenees. Around the seventeenth century they were began being used as rescue dogs. It is said that more than 2,000 people have been saved Saint Bernards through the years. They are able to find lost or injured travelers in the snow and cold weather. They then lick them and lie next to them and keep them warm while one dog from the search party returns to fetch help.